If you haven't figured it out yet – “organization” (i.e. – one's ability to keep things in order) is an extremely important aspect of any real estate business. …will have a massive impact on your level of effectiveness in this business. This isn't something that comes naturally to all of us. It took me about 6 months of fumbling around with different organization methods before I finally landed on the basic setup that I use today. As the video above explains, I use a free Dropbox Account that is synced between a few different computers that I use on a regular basis (one of which is my iPhone). Dropbox is an amazing tool that you need to be using if you aren't already. Without this free resource at my disposal, I would seriously feel like I'm operating in the stone age (and for all intents and purposes, I would be). The ability to retrieve information on your iPhone or Droid at the drop of a hat (and all for FREE, I might add) is a HUGE convenience that you ought to be taking advantage of. 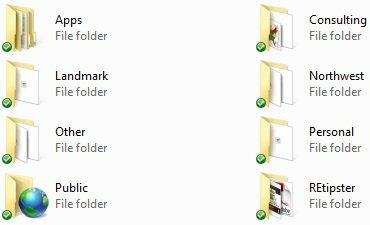 As of today – these are the 8 folders (each of which contains a massive amount of data) that constitute my entire life. As you can see – it's not rocket science, but it did (surprisingly) take a lot of mental energy to nail down an organizational system that would be consistent, logical and easy for me to follow. I could have tried organizing my properties by parcel number, address, or some other bizarre method – but these other ways just didn't seem to click – which is why I landed on the structure shown above. As you've probably guessed, the idea of being “paperless” is a pretty central component of my filing system. When I first started thinking about how to do this, it seemed like this would be a MAJOR pain to implement. After giving it a shot, I was surprised to find that it took about the same amount of time (or less) as my old paper system. 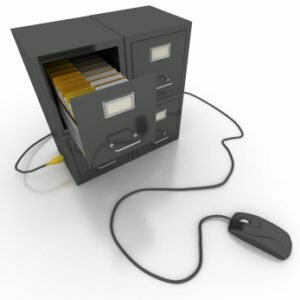 All I had to do was run the hard documents through a scanner and drop them into the appropriate folders and over time, it actually turned out to be a MUCH easier way to keep things in order. Probably the biggest plus, was that it gave me instant access to pretty much anything I could think of. If you're pondering whether or not it's worth the trouble to take your business paperless – I'm telling you right now, it's worth the trouble. That being said, there are a couple of reasonable investments I would recommend to make this process significantly easier over the long haul. This was huge for me. I'll admit, I deliberated for quite a while over whether or not to spend $600+ on a machine that would (in theory) solve all of my problems in one shot – but after biting the bullet, I was VERY glad I did. I bought the Brother MFC-8890DW. 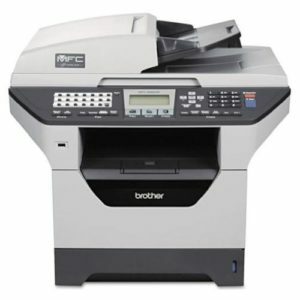 It's a wireless system that does a very high quality job of scanning, copying, faxing, printing and more. Unfortunately, there are a lot of “name brand” printers out there that are total garbage. If you're not sure what kind of unit to get, I can definitely vouch for this one – it's a solid option. 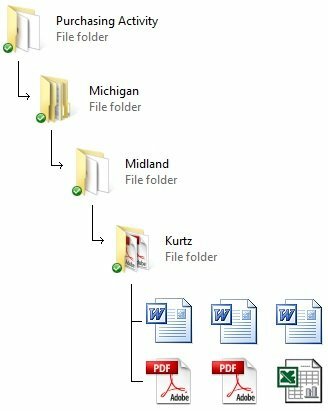 You can certainly survive with most “run-of-the-mill” computer monitors, but without a larger surface (one that allows you to pull up multiple documents on one screen), a paperless system will be a lot more cumbersome than it needs to be. To be honest… it's not even a bad idea to get two or even three monitors if you can swing it (especially if documentation is a major part of your business) but I'd say at the very least, you should have at least one 24 inch monitor on hand (this is what I have, and it suits me just fine). It doesn't need to be anything crazy or expensive – something like this or this should suffice. This is more of a luxury item, but if you're serious about going paperless – it is very helpful to have some software that will allow you to edit pdf documents without having to print them off and re-scan them. 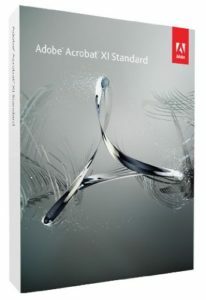 Adobe Standard will give you the flexibility to edit, delete, add, insert, rotate, highlight, and recognize text (among many other things) on the pages you scan into your system. I've got this exact software on my computer and I use it all the time. It's not terribly cheap (by my standards, anyway) – but if you have some extra funds at your disposal, this isn't a bad tool to have in your toolbox. Like I said before, there is no definitive “right” or “wrong” way to do this. This is just my way of keeping my business documentation in order. This is a system that had made sense to me and has worked quite well for the past 5+ years. As you're thinking this through, feel free to apply any of these ideas to your system – and if you think you've got a better way of organizing your files, let me know! I'm always curious to hear about new ways of improving my system as well. Your Phone Is Failing You. Here’s How to Fix It. BombBomb Review: Is It Time to Join the Video Email Revolution? Great article, Seth! It’s so true with keeping everything organized. I laughed a bit when I read #2 (dual monitors). I can’t function without my two monitors! Thanks Kyle! It’s an ongoing battle for some of us, but an important one nonetheless. I’m still working on my 2nd monitor – but I hope to have it soon! Spot on article. This is EXACTLY what I’m doing with all of my filings. It’s so funny seeing other people operate with archaic filing systems. I literally cannot work with someone who doesn’t know how to scan a document. Thanks Ian, I’m glad this post resonated with you too! I appreciate your feedback. Great post and video Seth. One question; can you get by on the free version of Dropbox for all those files? Hi Sharon – good question! I was actually able to get a few extra GB of space because I shared dropbox with a few people (and as a result, I was credited with some more space) – but yes, I am able to keep everything in the free account that I have. I try to keep out the huge stuff like video files and large pictures… it’s not too difficult. Great content, Seth. Using Cloud based systems makes so much sense, not only for easy access from multiple platforms, but also just as a means of backing up data. I personally have been using Evernote and have been happy with it, but not overly ecstatic. It’s great for taking notes and linking to other notes, but lacks the ability to go beyond one folder (or notebook). After looking at your system, I realized that I might be able to get the best of both worlds and merge the two – i.e., Evernote will be for notes and webclips and Dropbox for folders and files. Thanks so much for sharing. Hi John, thanks for sharing! I’m glad you liked the post. I’ve been hearing about Evernote for years now but I don’t have much experience with it. I’m guessing both systems probably have their pros and cons (as you eluded to). I’ll have to look into it more one of these days. O.K., Seth – your next project: Defining Best Google Tools for Real Estate Practitioners, A Helpful Overview & Guide to Help Sort, Integrate, and Use All Of Google’s Tools in your Real Estate Business. I too use Dropbox to organize my rental , real real estate and craigslist documents. Another great tool to utilize is Genius Scan. This is an application for your smart phone that allows the user to take a photo of a document and convert it to a pdf document. This was particularly helpful when negotiating offers while on the run. I now use it for everything from rental applications to sending in rebates. Thanks for sharing Tonya. I’ve used Genius Scan on a number of occasions and I agree, it’s awesome (and that fact that it’s free is even better)! I always like to look for open source alternatives to expensive software. I have never used an Acrobat alternative but I have had great experiences with other open source software like OpenOffice instead of Microsoft Office. The GUI is usually a couple years behind but they have full functionality. They can be found at alternativeto.net and sourceforge.net. Great to know, thanks for the tip Jake! Hi. I need to download the Drop Box it may work for me too. Go ahead and download it Clifford! There’s a link right above. Great article! This is a great way to simplify the business and have everything you need with you on the go! Thanks Seth!! Thanks Qasiym – I’m glad you got something out of it! Love this article. Organization is so key to an efficient business and you have done well. How do you organize your mailing lists as the process unfolds. Some records become “Sent offer”, “Agreement signed”, etc. How do you keep track of who to send follow up letters and offers to, as well as keeping your metrics and conversion rates? 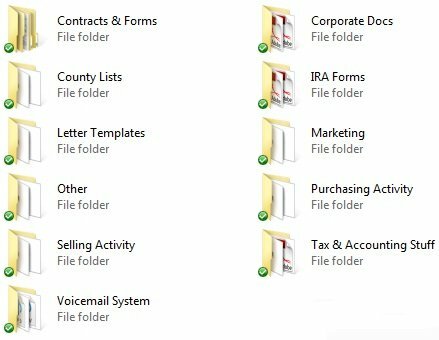 Hi Roman – I have a folder in my dropbox account, which contains different sub-folders for each state & county where I’ve sent out direct mail campaigns (and each folder contains the list I used and the postcard I sent). I don’t sent out any follow up offers after the initial campaign, and I don’t sent out blind offers either – so I have a different set of folders for the actual paperwork related to each deal in process (which is described above). I think you are my long-lost brother! I have struggled with the organization of multiple businesses for years, this can be the one single most frustrating challenging mind filling agonizing pain a business owner can go through. I wish I saw your suggestion for the brother printer last Thursday but I just recently purchased my first laser HP 252, extremely happy. Also check out for fid I wish I saw your suggestion for the brother printer last Thursday but I just recently purchased my first laser HP 252, extremely happy. Also check out for fijitsu is 500 scanner, for the price of about a car payment is the highest rated most invaluable tool I have. I work 90% of the road temperature in my office so I have an office identical in my car is in my house. Thanks Tim! I wish you all the best with that new HP printer! Organization is definitely a challenge for some of us (myself included) – but with a little bit of structure, you can definitely make it work. Best of luck to you! Thanks for the info. Yes I was wondering how you stay on top of the paperwork. Also, I was wondering if you use or recommend any accounting software like quickbooks or freshbooks or something else to help with your books. Thx. Hi Doug, I currently use QuickBooks – but if I was starting from scratch, I’d probably start with something like Freshbooks or Xero. Thank you for the article. As usual you have lots of great information to share. I have a suggestion for a future topic (that is if you haven’t already discussed it)… that is I need help with all my email accounts….. some on yahoo… some on gmail and then a couple linked to my websites. I have streamlined a few to forward to my gmail account but still not happy with the set-up. Just an idea. You are a great teacher and motivator. Thank you for all your hard work. – Marilyn S.
Thanks Marilyn! I appreciate the kind words. That’s a great idea for a future topic (and I have a similar issue, so I can relate). I’ll see what I can do to address that in an upcoming blog post! thank you for this post. To get organized is one of the most important things not only in Real State activity, but in all life. I agree. Organization is KEY. I’ve been using google drive across several PC’s & macs with success for years. I believe Dropbox is similiar to google drive. Thank you for your on going suggestions & expertise! 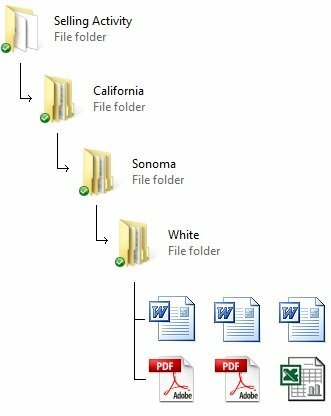 Seth, I think the Dropbox recommendation is great; however, you still have to have a hard copy filing system for those official documents from the state/county such as warranty deeds/titles. Do you just scan the top/signature pages to Dropbox or what is your system? Actually, once a deed is recorded at the county, there isn’t much of a reason to keep a hard copy of it (what’s recorded in the county’s files is ultimately what matters, because they only record originals in the first place). As long as they’ve got it, and I’ve got a pdf myself – I can store it digitally in dropbox for my files… no need to hang on to hard copies. Thanks for sharing Linda! I used to subscribe to the Adobe Creative Cloud (back when I had a student discount, years ago). If you actually use all the tools they make available, it’s definitely a solid value proposition.